Musician, designer and painter, Lincoln Hancock, exhibited his work at the Elliott University Center this past Friday. 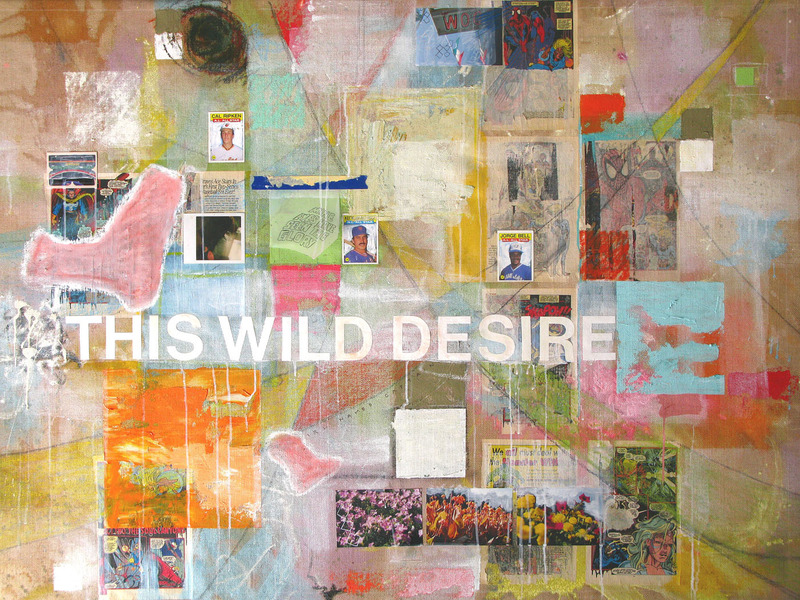 The artist, a 1998 Guilford graduate, creates large scale paintings that are covered in a range of pastel hues and includes outside materials such as vinyl letters, crayon, and magazine clippings. The spirited paintings deliver a message of movement, boldness and obviously music. 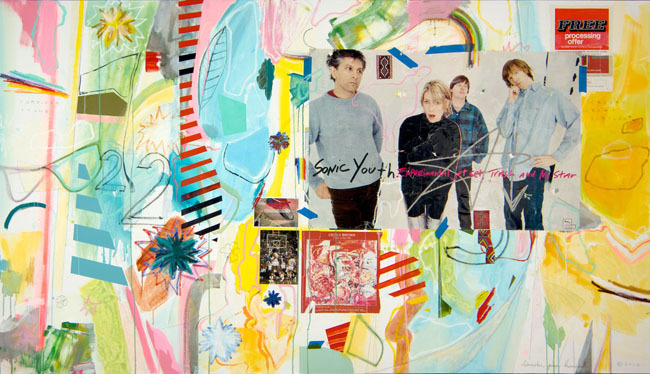 Each piece seems to have a bit of musical influence, whether it be part of a cd, bolded letters or a poster featuring Sonic Youth. The movement that the brush strokes create supports this message as well; their vivid expressions grid and layer the canvas with obvious intentions. The piece, Man Selling Ice Cream definitely exemplifies the feel of the music and the expressions that the paint bring along with it. When viewing this image one can almost see this piece being hung in a music venue, taped on a wall among various other musicians who have traveled through the state. 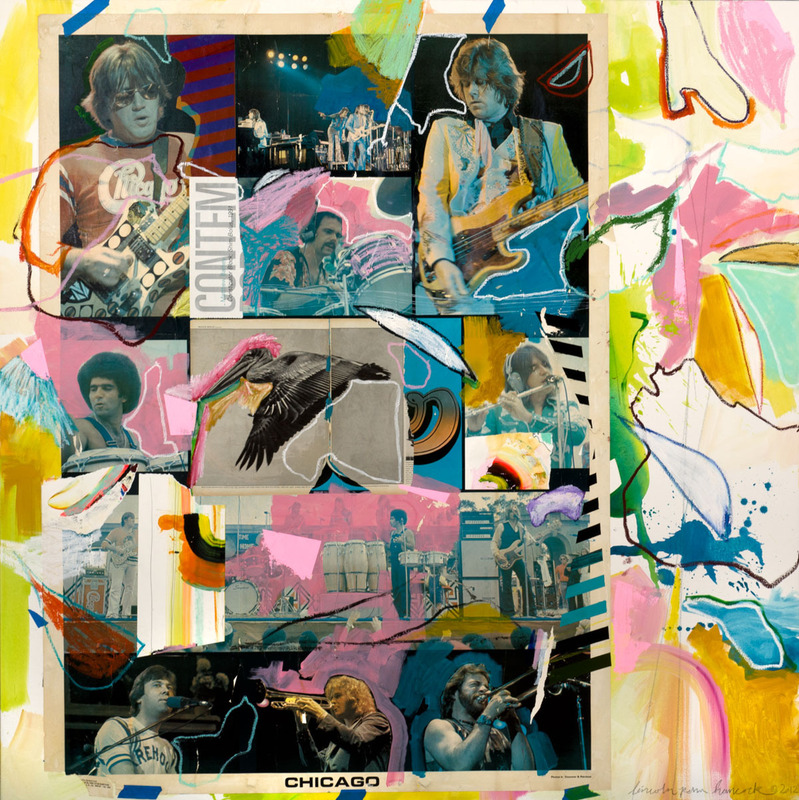 In comparison to these dark photos, Hancock dips the piece inside of a ice cream dream by utilizing pastel colors that mimic the title of the piece. 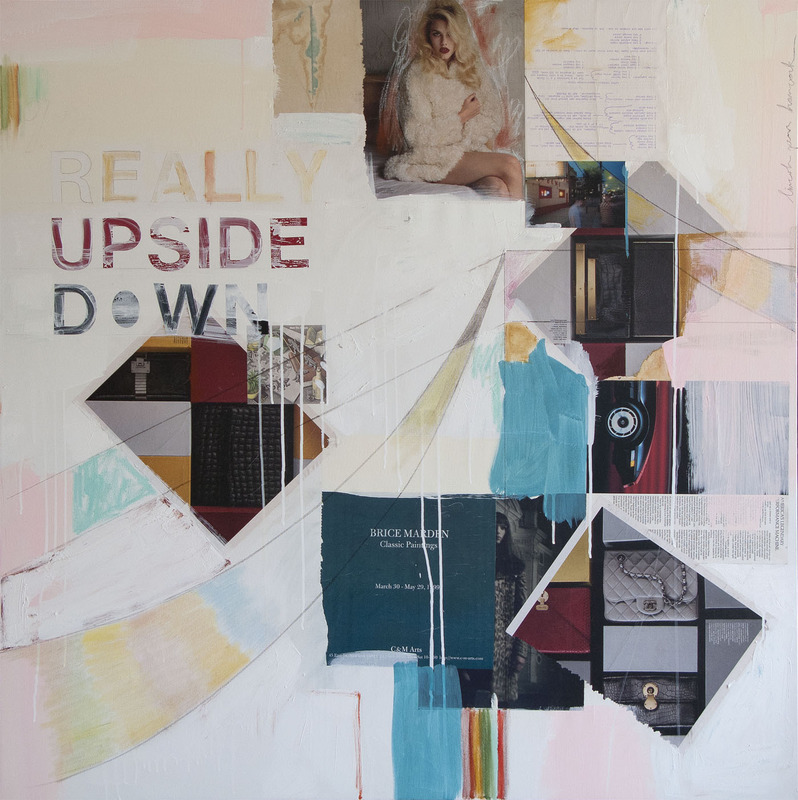 The collage-like feel of the painting creates a texture that one is able to see at the gallery itself; the layers of paint on top of the layers of magazine create a rugged feel in comparison to the overall fresh and youthful hues. As an English minor and a lover of words, I was immediately drawn to the pieces where Hancock applied vinyl lettering and various other texts written in pencil or in print. True/False, a piece that was one of the first I looked at when entering the gallery, drew me in because of the lettering that was utilized. The collaboration between materials is intriguing to me and the relationship between the paint versus the outside materials works well on the canvas. Personally, I find the pieces where the lettering is painted over much more appealing because of the push and pull between the paint and the text attempting to break through. An example of when the lettering is standing alone is This Wild Desire, which features baseball cards and the bolded title off centered. I feel as if the pieces where the words are covered with paint create more of a challenge for the viewer to look deeper into the piece, rather than just pass the text by as if it does not belong to the overall painting. Overall, the layered affect that Lincoln Hancock takes on his pieces enables the viewer to study every inch of the painted canvas. Looking at these works, I did not view them as collages or mixed media but rather a painting that was supported and inspired by the collection of quirks and belongings found underneath the acrylic, the bubblegum pink and overlay that makes up these pieces. Lincoln Hancock’s work can be found here. Also make sure to visit the gallery at the Elliott University Center! The exhibit will be up until March 8th.